Lying on the western arm of the Bertraghboy Bay in Connemara, County Galway, the village of Roundstone is one of the most scenic in Ireland. 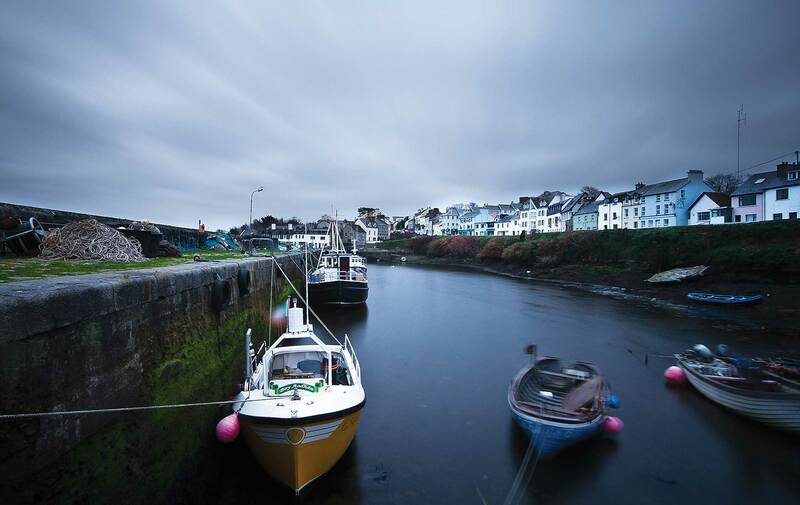 Situated seventy-seven kilometres north-west of Galway City and around eighteen kilometres from Clifden, Roundstone is beautifully set on one of the most spectacular coastal drives overlooking the Atlantic and settled at the foot of Errisbeg Hill. Roundstone is steeped in history. The village was founded in the mid-1820s by the celebrated Scottish engineer Alexander Nimmo, who was appointed by the Western District to build harbours, roads, and houses throughout the West of Ireland. In 1826, he bought a ninety-nine-year lease comprising 240 acres in the Roundstone/Letterdyfe area. He sublet plots of land along the road by the harbour for houses to be built on. Many of the settlers were Scottish fishermen and their families. A few built two-story houses with slate roofs, and those people got grants. All others were one-story thatched houses. Alexander Nimmo died at the age of forty-nine on 20 January 1832. The lease of the village was passed on to his brother John. John gave land to the Presbyterians to build their church (the Kirk) in 1840. The foundation stone was laid by Mrs. Martin of Ballinahinch. It was demolished in the 1930s. In 1835, a Franciscan monastery was established. Today only the bell tower remains, but a very lovely craft centre operates there, making and selling bodhráns, pottery, jewellery, and more. It is well worth a visit. Our Lady Star of the Sea Catholic Church was built in 1832. Saint Mary’s Church of Ireland was built in 1843 and is still in use to this day. 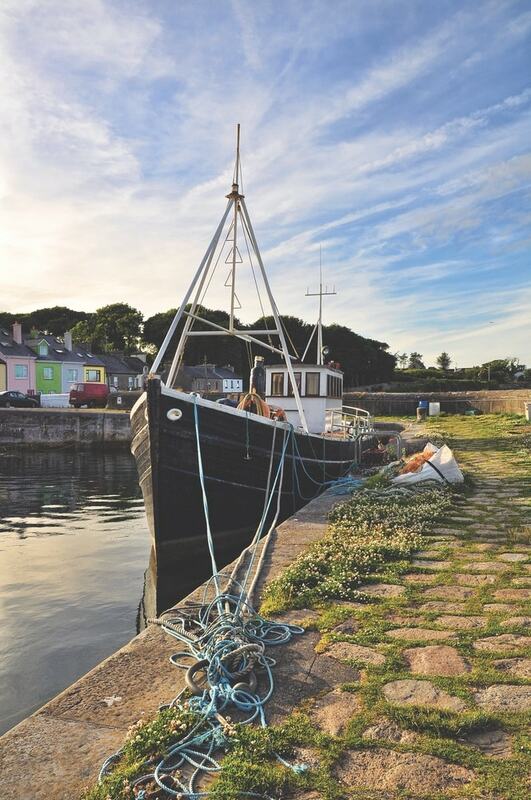 In Roundstone, you will find a busy working harbour where local fishermen return each evening with their catches—anything from lobster to mackerel. When the mackerel are running (in season), they can be fished from the pier. The harbour is always a hive of activity with people pottering around on their boats or setting out to the nearby islands. Roundstone has a variety of first-class restaurants and cafes serving the best of fresh fish and Connemara lamb. In the cafes, some of the finest home baking can be found—and coffee to die for. Two hotels and lots of B & Bs offer accommodations for travellers, but it is always advisable to book in advance to avoid disappointment; July and August can get very busy. Today only the bell tower remains, but a very lovely craft centre operates there, making and selling bodhráns, pottery, jewellery, and more. Inishnee is just across the bay from the village but can be reached by car as well as by boat. It is an excellent place for a walk, and while there, please visit Saint Matthew’s graveyard. It is the oldest cemetery in Connemara and contains the ruins of a medieval church and graves dating back to the twelfth century. Roundstone is a haven for artists. Some of the finest pictures for sale today are from various places around Roundstone. Two artists live in the village: one is Yvonne King, a local woman; the other is Belfast-born Rosie McGurrin. Both are very well known. Each year, Rosie hosts the Inishlacken Project, where artists explore the beauty of this island just off our shores. Inishlacken was made famous by the renowned Northern Irish artists Gerard Dillon, James MacIntyre, and Seamus Coleman, who spent a year living amongst the natives, painting, and living the island life. We have two of the most beautiful beaches—Dog’s Bay and Gurteen. Dog’s Bay is a horseshoe shape, and has the purest of fine sand, formed exclusively from coral shells, and is very unique. It lies back-to-back with Gurteen Beach, creating a tombolo. Both are very safe for swimming and other water sports such as kayaking, standup paddleboarding, windsurfing, and kite surfing. For anyone seeking a destination that showcases the quintessential Connemara, Roundstone is the perfect retreat.